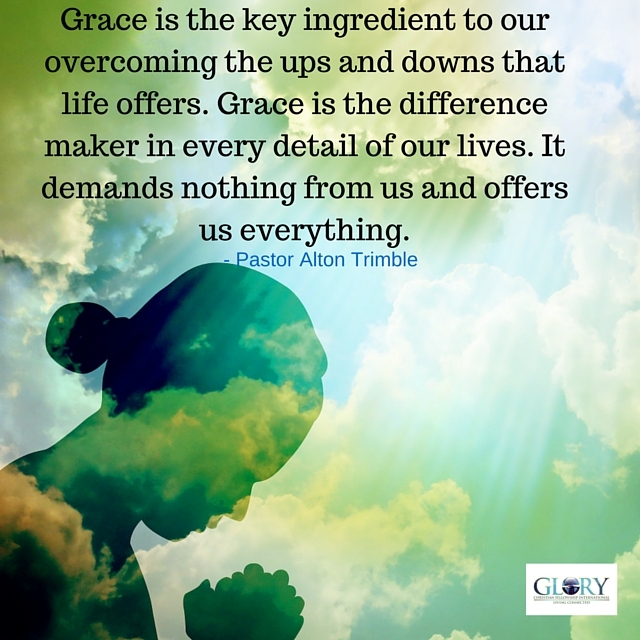 Grace is the key ingredient to our overcoming the ups and downs that life offers. While we will have responsibility in bringing to resolution that which confronts us, Grace is the difference maker in every detail of our lives. It demands nothing from us and offers us everything. • It’s more than enough for all our concerns. II Corinthians 12:9 – And He said to me, “My grace is sufficient for you, for My strength is made perfect in weakness.” Therefore most gladly I will rather boast in my infirmities, that the power of Christ may rest upon me. • There is no competition. Romans 6:14 – For sin shall not have dominion over you, for you are not under law but under grace. 4. It’s free to us. • He paid the price for us; nothing we do produces grace’s outcome. 5. It’s apportioned according to need. • God has the grace you need to overcome. • Grace is always on time. • Grace stands in our stead. God’s grace, my friend, is sufficient for us. Meditate on these thoughts! Grace, where would we be, what would we do without His GRACE. Grace changes everything, it brings light to dark situations.